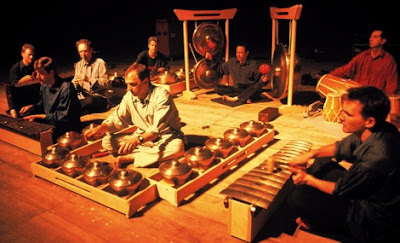 Follow this link and sample that special soundworld online with a complete concert from CBC of music for gamelan by Colin McPhee and contemporary composers. While elsewhere you can play your own Virtual Javanese Gamelan using free software developed by WCS Music using the Javanese Gamelan of Wells Cathedral School. Their website reports that using the expertise of the music faculty of the Cathedral School, and leading consultants, an innovative and award winning suite of music education software has been created. This allows users to explore one of the liveliest forms of Javanese Music, the Lancaran, and take part in an ensemble performance using sampled sounds from a gamelan. There is also the opportunity to compose and export audio files, and learn about Indonesian Music using online resources. The first module of the Virtual Javanese Gamelan is available for immediate download free of charge from the WCS Music website. Reader reports on the software are welcome. Lou Harrison was one of the Western composers who embraced the gamelan. I am very grateful to regular reader Jean Missud of Fitchburg State College, Massachusetts for sending me a link to a wonderful interview with Lou Harrison. Which is a very approprite way to end this gamelan post.